“I like eavesdropping from here,” says the curious snoop played by Kim Min-hee after a table of talky cafe patrons notice her jotting down notes about their private conversation. 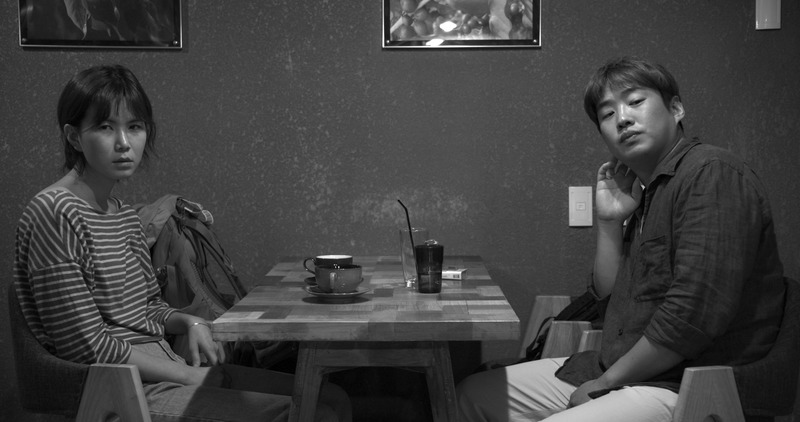 In a way, the latest prickly gem from South Korean master Hong Sang-soo is all about private thoughts unmasked in public, and as a result, becomes an extended reflection of the director’s onscreen obsessions and off-screen exploits. But in truth, this acidic black-and-white gabfest is a far denser interrogation of masculine insecurity. It’s made up mostly of heated arguments between couples (both imaginary and real) who pass blame and trauma back and forth like verbal hot potatoes, spitting venom to avoid addressing the cowardice and jealousy that mark their failed relationships. Hong’s patented onscreen binge drinking sessions only make these tirades more destructive, permanently blurring any chance at finding a beginning, middle, or end to any given conversation. Why such a cynical and bleak outburst of raw emotion from the director who just last year produced something as effervescent as Claire’s Camera? Might it relate to Hong’s own extra-filmic affair and breakup with Kim? It seems that even in a soju-fueled haze, breakin’ up is hard to do.